abuse | Why Not Train A Child? This article by Claire Roise looks at how society’s views of cigarettes and seat belts have changed over the years and how it would look if abuse followed suit. It is a very interesting article and I recommend it highly. I remember the changes she discusses quite well. (I was an oddball child who insisted on wearing a seat belt back in a time when they were not used at all. I remember digging them out from under the seat and brushing off all the gunk.) Society’s views of abuse have been changing over the years, but very slowly. Too slowly. Rebecca has written a very helpful review of the crime thriller 13:24 by M. Dolon Hickmon. This review explains how triggering this novel is for victims of abuse and why it is not appropriate for everyone. I, for one, appreciate the warning. M Dolon Hickmon: I appreciated this review and understand her confusion. This book was intended to be very different from what people who read child abuse books probably expect. First, I do appreciate the many readers who have shared their own abuse experiences and are far along enough in their own recovery to read and say, “Yes, this is accurate in describing abusive corporal punishment and what it is like living with PTSD.” Those testimonies are invaluable for establishing the credibility of the book. However, this book was definitely not meant to be read therapeutically by survivors. Nor was it intended for any of the other audiences that Rebecca mentioned! The goal of this book was to reach crime fiction fans — for instance, the six million people who watch Law and Order Special Victims Unit each week — with a story that combines stylish, horror tinged entertainment with the accuracy of a child abuse memoir and the factual medical information of a semester of abnormal psychology. One reason for doing this is the vast difference in the size of the crime thriller and child abuse audiences. This was dramatically demonstrated this weekend: I ran a small ad targeting people who’d signed up to get offers of discounted ebook thrillers in their email. Before the emails were even finished being sent, my book was catapulted into the top twenty of all child abuse titles. With an additional push from several activist communities, the title strolled easily to number one. But while maintaining the number one slot in child abuse by a huge margin, the book barely registered in the top 100 for Crime Thrillers. Viewed in the other direction, what this means is that if ANY book about child abuse were to reach the top twenty in crime thrillers, it would be selling more copies per day than ALL of the child abuse books on Amazon combined. That is a tremendous opportunity, and that is the first thing i had in mind when I was writing. Of equal importance, from an activism standpoint, is that all of the books aimed at the traditional child abuse audience are ultimately read by the same small group of readers. This accomplishes next to nothing as an awareness campaign, because it doesn’t reach anyone who doesn’t already know all about the topic. This weekend was a huge success for me, not because the book had number one in child abuse, but because it actually made it onto the crime thriller chart, peaking at #75. This is the first time I have managed it, and the difficulty shows just how much bigger the game is on that level. I now realize that the number of books sold per day in the thriller category dwarfs anything I even imagined. Finally, I hope it’s obvious that this book was not written for Christians or to change the minds of parents who are on the fence about spanking. This is a book about child abuse. Primarily, I wanted people on all sides of the modern spanking debate to consider that conversations they have with other adults can be overheard and misunderstood by children who are being physically abused. It is not enough to frame our conversations in words that a reasonable adult could understand–we all need to consider how every word that we speak and write about corporal punishment will either empower victims to seek out help or convince them that are not deserving of any. Why Not Train a Child? : Thank you for that clarification. I do hope you understand that I wish you success in your endeavor while also needing to take my intended audience into consideration. M Dolon Hickmon: I think we need to have a shout out on corporal punishment–from every angle and with every bit of creativity and energy that we can muster. Having said that, the USA didn’t abolish slavery by convincing the slave owners that it was wrong and they should give it up. It was accomplished by making the people who didn’t own slaves appreciate the horrors of slavery so they felt obligated to do something about it. I don’t think that people who beat their kids are motivated at all to stop. They will stop when the law steps in and says, “Enough”. And the political will to get those protections in place is going to have to come from the broader culture. It goes on for the same reasons that slavery continued: the people responsible LIE about what is being done. When the public understands what their euphemisms actually mean, they will say, “enough”. Why Not Train a Child? : Yes. That we have different audiences was kind of my point. M Dolon Hickmon: Rebecca was dead on with all of her observations. But, for example, anger, hostility, aggression and violence are typical male reactions to trauma; it is how men deal with feelings of vulnerability and inadequacy. To point it out as something unusual in survivor writing is exactly right – but the REASON it is strange is that the tenor of survivor discussions has so far been heavily led by female voices. I related to this review. Basically, I read what others were writing and thought that it didn’t really reflect my experience. So I wrote something that did. Rebecca Diamond: M Dolon Hickmon – I really did – I don’t want to say I enjoyed reading the book, because it was honestly a hard read – but I truly appreciated your voice throughout it. I tried to convey in my review that it definitely wasn’t for the audiences I listed, so I appreciate your clarification on who the audience is. And I congratulate you on your success! That’s amazing to get into the top #100. I think that an epilogue or author’s note explaining the real-life connections; that this wasn’t just a thriller, but actually is happening around people more than they think, that the compliant smiling child that everyone compliments on their behaviour could indeed be a victim of horrific abuse, is an important point to make. And it would be great to see a list of tangible ways that the reader could do something in response, as well. Your novel is well-written, and I think it will linger in the minds of readers, even those who aren’t survivors. Giving ways to react/change/make a difference would take that lingering energy and help transform things, I really do believe. M Dolon Hickmon: Thanks for reading and reviewing; Its really interesting to see what people think who have read it cold. I spent more than five years writing, and there are so many little details that some people notice and others don’t. It’s fascinating to see what, in particular, comes to the front for different people. There is a prologue that steers people to the book’s website, where I have collected some of the stories of real life cases that the book is inspired by. I think that if you read the EBook it starts at chapter one, so you may not have seen it. A lot of reviews on goodreads have mentioned it but it may need to be handled differently. It’s always a challenge between essentially luring people in as a thriller, and making sure that they know that all of the crimes in the book are based in fact. I would like to do more with that website but I am working full time at a sweaty, calloused hands job and taking care of a three year old, while also doing tons of writing and managing promotions like the one this weekend–which was the culmination of a year of lining up a complex choreography. Every step is a learning experience as I am trying to do something that has not been done before. Ultimately, my hope is to create a new genre of survivor fiction. I would like to see others taking their stories and presenting them in ways that are marketable beyond the small circles of survivors and professionals. I sold as many books in April of this year as I did all last year; the main reason is getting away from branding it as a child abuse book and trusting that people will accept it as a straight thriller. So much of that is just confidence from many many readers, and from the support I have gotten from professionals like the editors at Publishers Weekly. This weekend it really hit me that what I have been guessing at, about the relative sizes of audiences, is not only true, but is obvious to professionals at PW and Kirkus. All along, people inside the book business have immediately understood that the potential of the concept to influence the world is phenomenal. The trick is getting the blend exactly right and figuring out how to market it. Your comments about the audience are right on. This is a book that does not have a ready made shelf. But that’s not a flaw; it’s how I designed it from the beginning. In police procedurals, the victim is given one monologue to describe being abused and how it affects them–it’s not enough to do justice to the experience. Child abusers memoirs do justice, but people don’t want to read them. So I created something new. It puts me in a bind because I need survivors to endorse the book as accurate–but it’s not a book that was written for them. It’s written for everybody else. Publishers are in business to make money, not to change the world, and they would rather print something that fits a known genre with a predictable number of sales. So it’s basically been up to me to believe in it, to develop the product and the funding for it and to do all the publicity. It’s a lot – lots of time and energy and money. I am also working on a second novel, by the way. I am learning at every step. When the next one is done I will have so many advantages. Have to remember that a year ago I was a guy with a stack of papers, zero Facebook friends and a dream of changing the world. The things that have actually happened since then I can hardly believe. M. Dolon Hickman shares his testimony and background of how he came to write his book, “13:24“ as well as how his father repented of his abuse in, My Father Repented of “Christian Spanking” Too Late. Crystal Lutton discusses responses to the Adrian Peterson case. Speaking of Crystal Lutton, she also explains what the Bible says about spanking. When considering Adrian Peterson, Rebecca Diamond says that she was spanked and she turned out… well, you’ll have to read her post to find out. Jennifer McGrail compares Adrian Peterson with Ray Rice in Hitting is Hitting is Hitting. Well known NBA player, Kareem Abdul Jabbar condems spanking in Time Magazine. So that is why I’m reviewing this book. I need to know what it says. I need some answers as to why my parents seemed to hate me so much. Why they were constantly angry with me. Why I was beaten with belts, punched in the stomach, slammed into walls, slapped across the face, and berated constantly, all in the name of tough love, the Bible, and most often, “Dr. Dobson says…”. Why I was never permitted to tell my side of the story or explain myself. Why they always, always, always assumed the worst about me. I need to know. I need to heal. So without further adieu, let’s dig in, shall we? She starts here with the Dedication, and already has 7 posts up and is only on page 19 of the book at this writing. It is very sad that her parents tried to raise her under Biblical teachings and yet failed to raise her to believe the Bible as an authority in her life. 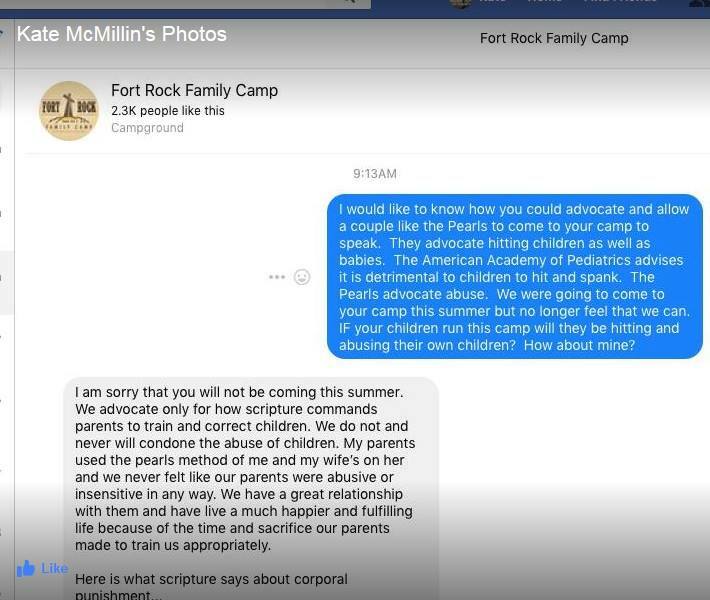 This is just another example of how these kinds of harsh teachings fail both children and their parents. Disclaimer: this blog contains mild profanity. Doug Phillips stepped down last October after admitting to an inappropriate relationship with a woman. On March 27, the Christian Post reported that he was threatening his closest friends of conspiring to destroy him. On April 14, WND reported that Lourdes Torres, Doug Phillips former nanny, was suing him. 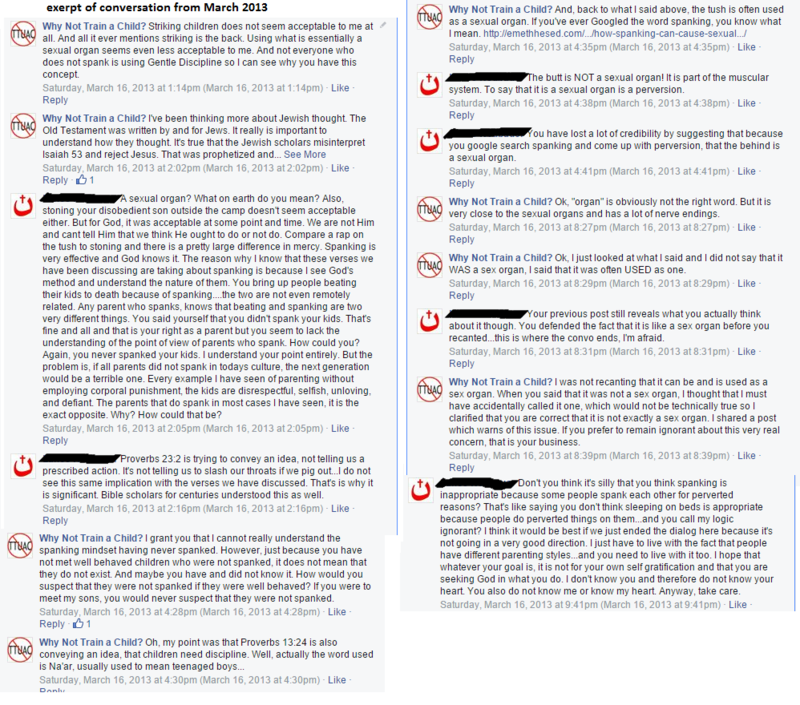 Vision Forum denied the allegations on their Facebook wall. I was asked in the comments to my post, The Beast Look At Homeschooling, why I believe that regulation of homeschooling is a slippery slope and what would be appropriate oversight to prevent abuse. The Daily Beast looks at the problem of certain parents who use homeschooling as a way to hide their abuse in The Sinister Side of Homeschooling. This article does make it clear that homeschooling is usually not done as an excuse to abuse and that most homeschooling parents are not abusive. However, the author of the piece also appears to be advocating for more oversight of homeschooling. I am not sure I agree with that. More children who attend public schools are abused than homeschoolers and even so, many die. How much oversight would be necessary of homeschoolers in order to make sure that they are not abused? I do feel that it would be a slippery slope. Last Week, I mentioned that Homeschoolers Anonymous was collecting stories and testimonies from those who were affected by Pearl’s teachings. Well, their “Pearl-Style Discipline Week” is over, so I thought I would link to their collection of tragic stories. This series is not for the sensitive and/or easily triggered. I especially want to highlight ExPearlSwine’s testimony in which a former Pearl follower explains how she followed Pearl’s teachings to the letter and exactly how and why those teachings are dangerous. The Pearls’ defenders will say, “Oh, they took it to an extreme and should have known better.” If anyone knows better than to keep inflicting more severe discipline on an intractable child, they can only apply that knowledge by scuttling the Pearls’ sadistic teaching and being more reasonable. M. Dolon Hickmon shares about the abuse he endured while growing up and how being spanked “The Right Way” almost destroyed him in this (*triggering*) letter he wrote to Michael Pearl. This post serves to introduce his Opus (a work of fiction) which apparently needs backers. However, it does seem like it could be of interest to my audience, especially since works of fiction have been known to be the catalyst for social reform in many cases. Some notable examples would be Uncle Tom’s Cabin, Ramona and The Grapes of Wrath. Here is the author’s response to the question of why he doesn’t just get a publisher. Update: The book has been published and got a favorable Kirkus Review. Calulu has a book review of M. Dolon Hickmon’s book 13:24.